FLSmidth, major supplier of equipment and services to the global cement and minerals industries, employs over 15,000 staff in more than 40 countries, with project and technology centres located close to its customers around the world, writes David Woodruff, Key Industry Director, Coal at FLSmidth. Serving customers in the cements and minerals industries, FLSmidth offers a wide range of products, from single machinery to complete plants and facilities. In addition, the company also takes a full-service approach before, during and after installation; offering customers expertise in project management, engineering and other professional services. FLSmidth supplies the world’s leading mining and power companies with a wide range of equipment. Very few companies can match FLSmidth’s coverage of the entire flowsheet, from run-of-mine material to the final product. Specific to coal handling, it can customize multiple product solutions through offering a range of mobile and fixed crushers, sizers for in-pit or out-of-pit applications, and fixed or mobile conveyors configurable to optimize any mine site. Within FLSmidth’s conveyor line, it has successfully supplied trough and pipe conveyors for many coal handling applications. In addition, FLSmidth has a range of shiploaders and unloaders, including pneumatic, grab- and screw-type models. also in India, FLSmidth is working with NTPC-Tamil Nadu Energy Company Ltd. to construct an external coal handling package including a 4,000tph pipe conveyor. Vale has long been a client of FLSmidth. The recently awarded Vale project contract includes design, detailing, fabrication, supply, delivery to site, supervision of erection and commissioning together with start-up assistance. In accordance with FLSmidth's One Source strategy, full lifecycle support will be supplied from the FLSmidth service centre in Tete, Mozambique. The material handling equipment to be supplied includes a crushing plant and in-plant and stockyard conveyors. The crushing plant consists of a tip bin, feeders, primary, secondary and tertiary sizers as well as supporting steel structures and auxiliaries. The process equipment includes FLSmidth Ludowici® Reflux Classifiers and horizontal belt filters. FLSmidth has previously delivered a crushing plant and filters for the first phase of the Moatize mine along with a contract for supply of equipment for Vale’s Nacala Port expansion. This second phase of the project will enable Vale to approximately double the production capacity at the mine. FLSmidth’s coal handling project with PT Adaro in Indonesia is nearing completion. The material handling equipment is part of the client’s mining operations expansion which will enable a decrease of the average hauling distance of the overburden trucking operations, and therefore, the company's dependency on oil. The supplied equipment comprises an out-of-pit overburden crushing and conveying system, consisting of FLSmidth ABON® sizers,RAHCO® overland conveyors, and RAHCO mobile stacking conveyors. The system has a capacity of 12,000tph and an annual overburden volume of 40 million bank cubic metres. FLSmidth’s Indonesia office will provide the mine with customer service aftermarket support. As mentioned earlier, FLSmidth recently supplied two grab ship-unloaders and one shiploader in a coal handling project to Vattenfall Europe Power Energy in Moorburg, Germany. The system capacity is 1,500tph with a grab capacity of 32–40 tonnes. The boom working area is 38m longitudinal travel. The shiploader operates at 200 to 1,000tph. To remain competitive, the FLSmidth team understands that it is not just about what equipment they offer, but how the company operates, as well. With global sourcing strategies, cost- efficient engineering practices, and streamlined manufacturing, FLSmidth has the expertise and worldwide systems in place to provide competitive pricing on its quality equipment offerings. For example, FLSmidth is directly supervising a manufacturing project in China involving the manufacturing of 12,000 tonnes of steel. FLSmidth also has several service Supercentres that have been opened to foster partnerships with both customers and local communities. These Supercentres are strategically located close to both mining and cement operations, and offer parts warehouses, conference rooms, testing facilities and training centers. improvements to many existing product lines. Equipment for in-pit crushing and conveying (IPCC) applications such as the Triple Track Mobile Sizer and Dual Truck Mobile Sizer are evidence that they are pushing the boundaries of what is possible in mining. The Dual Truck Mobile Sizer (DTMS) is the world’s first fully mobile truck dump station and is unique in that it interfaces directly with rear dump trucks. The DTMS works like a large, mobile, shovel- fed sizing station, but with the added benefit of truck haulage to ensure flexibility and efficiency. In addition, by using a shiftable face conveyor and a mobile overland hopper, a mine can achieve a highly mobile system and a considerable reduction in its fleet of haulage trucks. FLSmidth is currently developing wagon tipplers capable of handling train wagons of varying dimensions. These tipplers will also come on single or tandem configurations depending on capacity requirements. With the success of the Tutupan coal handling project in Indonesia and the Karara overburden handling project in Australia, FLSmidth continues to lead the industry in large capacity mobile stacking systems. Success was achieved on both of these projects through working closely with the client to optimize equipment arrangement and function, ensuring top performance at the mine site. Each of these can handle over 12,000tph, reduce operational costs, and also deliver increased sustainability benefits through a reduced carbon footprint. These developments and more are sure to keep FLSmidth on the cusp of tomorrow’s solutions, all driven by the needs of their clients. FLSmidth will be adding more capacity with its complete line of material handling equipment at projects around the world, demonstrating its technology leadership and focus on its core industries of coal, gold, copper, cements, fertilizers and iron ore.
During the year 2013 Mantsinen Group Ltd Oy continued to grow and strengthen its position in the marketplace, with the vast majority of its machines being sold for use handling coal. Both Mantsinen Group business units — Material Handling Machinery and Logistic Services — expanded successfully into new territories. The Material Handling Machinery division has focused on hydraulic material handlers and harbour mobile cranes, as well as on attachments to complement the machinery range. Mantsinen material handlers are available from 70 tonnes to over 200 tonnes. All Mantsinen material handlers are available with either diesel or electric engines. Mantsinen provides an undercarriage customized according to the needs of the customer, and all material handlers are available on tracks, on rails, with wheels or stationary. Mantsinen has a wide range of attachments, such as clamshell buckets, orange peel grabs, roundwood grapples, sawn timber spreaders, big bag spreaders etc., so customers have a complete package from Mantsinen. Mantsinen is committed to the continuous improvement of its material handler product range. Environmental issues, such as improving energy efficiency and reducing particulate and noise emissions are important for Mantsinen. Mantsinen HybriLift® has a proven track record of reducing fuel consumption up to 35% and in some cases even more. Productivity and a long life span are critical features for all material handling equipment. Mantsinen’s R&D team strives to continuously improve the performance of material handlers, and reduce the operational costs. 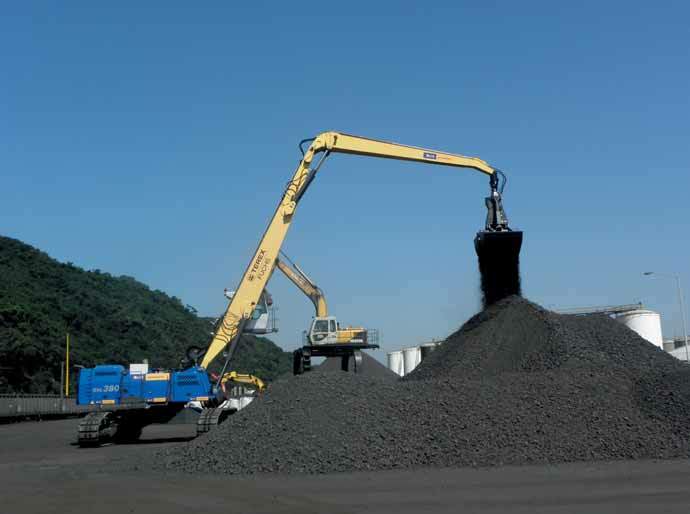 During 2013, the majority of Mantsinen machines were ordered and delivered to coal handling. Over 70% of total sales was related to coal handling, mainly in Russia. The total amount of coal handled by Russian ports in 2013 was 101.1mt [million tonnes] (+13.3% year-on-year). Port Visotsk received two Mantsinen 120 R HybriLift®s in December 2013. Port Visotsk currently has a fleet of four Mantsinen 120 R HybriLift®s, two Mantsinen 105 ES and two Mantsinen 100 RHCs. Vanino Commercial Sea Port ordered four Mantsinen 120 R HybriLift®s and four Mantsinen 70 Rs in summer 2013 and machines will be delivered in the first quarter of this year. Vanino Commercial Sea Port now focuses only on coal handling. The port will have a fleet of 15 Mantsinen material handlers in total once the set of eight brand new Mantsinen are commissioned. one Mantsinen 200 ES HybriLift®,Tuapse Commercial Sea Port, Russia. In 2013 Mantsinen Group turnover was approximately €55 million, with a growth of approximately 5% compared with the previous year. Company turnover has been growing in both business units, Material Handling Machinery and Logistic Services. Mantsinen is a multinational company and employs about 450 people in Finland and Russia. Mantsinen Material Handlers have found customers in nearly 30 different countries and the distribution network is widening rapidly. Mantsinen celebrated its 50 years in material handling business in 2013. The outlook for 2014 is positive. The order book has grown steadily during H2/2013 and reflects the slightly brighter general outlook, especially in the eurozone. Mantsinen holds a leading market position in Russia and new models are taking over Europe as well. Mantsinen has invested in improving distribution network and is establishing dealerships in Asia. one Mantsinen 200 ER, Ugursan Shipping and Port Operations Co, Turkey. A major product launch in 2014 will be Mantsinen 200 M HybriLift®, the largest hydraulic material handler on wheels ever produced. The Mantsinen 55 series will be launched summer 2014. New innovations to enhance material handling productivity with even less energy are continuously researched and applications found. EECV in Rotterdam keeps on expanding and improving. In 2013, its transshipment of coal increased and it installed a new bucketwheel reclaimer with a capacity of 3,500tph (tonnes per hour). EECV chose a direct drive system from Bosch Rexroth for this big bucketwheel. The drive system consists of a Hägglunds MB 1600 motor and a DUe drive unit. It is the seventh bucket wheel reclaimer at EECV with Hägglunds direct drive systems installed and has been in successful operation since February. Direct drives are ideal, not only for the bucket wheel itself, but for many of the main functions on a stacker/reclaimer. Their specific advantages and high torque capacity make them well- suited for heavy duty applications. In 1987 EECV installed the first Hägglunds direct drive on two of its apron feeders in Rotterdam. Since then, it has installed direct drives on the remaining apron feeders, its bucketwheels, slewing drives, long travel drives and conveyor head wagons. Today some 150 Hägglunds direct drives can be found at EECV. In addition to the Hägglunds drive systems, the stacker/reclaimers and unloaders are also equipped with Rexroth cylinders and power units. The cylinders range from relatively small, suitable for hinged lids, to massive units that hold the arms or jibs. Performance of bucket wheel stacker/reclaimers is essential to EECV operations. When problems were encountered here, it chose to install the first hydraulic bucketwheel drive based on its positive experience with direct drives on apron feeders. The solution was the prototype of the Hägglunds MB 1600 motor. The advantages of direct drive on bucketwheels soon became apparent, with features such as variable speed that optimized material throughput, while overload protection and high starting torque reduced stall delays from the prior 90 seconds down to about ten seconds. In addition, the highly reliable system features low weight that reduces the load on the slewing bearing, while its excellent overload protection has significantly reduced both downtime and maintenance costs, which are even further reduced by soft, smooth starts. The first hydraulic bucketwheel direct drive was commissioned in April 1991 and has now logged about 50,000 trouble-free hours. After 7,500 hours the motor was opened and inspected in the presence of EECV engineers. The results were impressive: everything was in perfect condition. In 1992 EECV ordered an additional three direct drive systems for its remaining three stacker/reclaimers. The hydraulic bucketwheel drive has boosted production by a total of about 15–20%, depending on materials and circumstances, while simultaneously slashing maintenance costs. Over time, the slewing drive on the first three stacker/reclaimers was also replaced by direct drives. The small, compact Hägglunds CA motors with MDA brakes were soon also found to be suitable for the long travel drives that move the large ship unloaders along the rails. Between 2001 and 2010, direct drives were installed on the long travel drives of the ship unloaders, providing benefits such as simplicity, automatic load-sharing and reduced system complexity. In all, 54 direct drives, 18 on each unloader, were installed on the long travel drives, providing a compact and clean solution around the wheels, fewer components in the contaminated area, and convenient cleaning using water jets. Maintenance also improved and could be concentrated to a single sheltered convenient location. In 2005 EECV expanded operations to encompass coal transshipment. Two new stacker/reclaimers and a barge loader were ordered for this purpose. Hägglunds direct drive systems were fitted on the bucketwheel of the stacker/reclaimers, as well as on the long travel drives. The barge loader was fitted with 12 Hägglunds CA motors and Bica brakes. In 2008 coal operations were further expanded with a new ship unloader, a grab-type portal crane with a 65-tonne hoisting capacity. This time around, Hägglunds direct drives were specified for the long travelling wheels, the feeders below the bunker and their head wagons. The long travel drives were equipped with 18 CA 100 motors with MDA 14 brakes, one on each side of a double wheel set. This clean, compact solution results in excellent load-sharing, as well as smooth starting and stopping. Two Hägglunds CB 280s with built-in crossover valve and speed encoder are installed on the feeders, providing advantages such as excellent starting torque and performance, overload protection, and convenient maintenance. Two CA 70s were also installed on the head wagons. Drive units and the rest of the system were engineered, produced and delivered by Bosch Rexroth in a collaborative effort involving its German and Chinese facilities. The latest addition to Rexroth’s wide range of products is the Hägglunds CBM motor, released in late 2012, yet another direct drive that is advantageous for many heavy duty applications. The new motor opens up new possibilities. The CBM not only handles heavier workloads, but also occupies less space and places less weight on the driveshaft. This allows customer machines, and in some cases the facilities that house them, to be smaller, lighter and simpler. The motor’s reduced installation requirements, combined with improved productivity, can translate into lower overall investment and higher long-term revenue. Added to this are the unique operating advantages of a hydraulic direct drive: full torque from zero speed, protection from shock loads, overload protection and four-quadrant operation. In the following article, Peter Cooperman of Triple Point Technology discusses how hydraulic fracturing has set the stage for US coal to enter international markets and create historic levels of volatility for market participants. Leaders in the coal industry, including Rio Tinto,Vale and Anglo American rely on Triple Point Technology software to navigate this volatility, manage risk and optimize their end-to-end supply chain operations. Market sentiment suggests that the coal industry must prepare for a volatile year in 2014. Many companies will find themselves in an unfamiliar role as the flow of energy-related exports and imports change course. New technology in the form of specialized equipment and techniques used to recover natural gas and oil, combined with regulation to limit emissions is due to have a lasting impact in world markets. Among those in the energy industry, coal producers and traders are most likely to experience dramatic effects that will reduce regional selling opportunities and force them into international markets. A larger footprint brings on new levels of complexity alongside a disappearance of long-term contracts and a growing number of spot transactions. The impact of these changes increases the level of risk present in today’s market that can only be addressed using enterprise commodity management and supply chain optimization software. Triple Point’s Commodity XL for CoalTM, Commodity XL Pit to Port®, and Commodity XL PortVu enterprise software solutions are relied on by world leaders in the coal industry to guide decisions that mitigate commodity risk, maximize blending and processing efficiency and optimize end-to- end coal supply chains. North America has become a world leader in hydraulic fracturing and the natural gas recovered has had a major impact on all competing energy commodities, but none as much as coal. While still the leading source of power generation in the United States, it appears to be only a matter of time before natural gas takes over. Miners and traders in North American markets are feeling the constraints of lower margins and displaced demand, as investments are made to bring natural gas to more parts of the country through investments in pipelines, processing plants, refineries, and other infrastructure. Meanwhile, environmental regulations and low relative prices have already motivated many power plants to replace coal-fired plants with new gas-burning facilities. Even the plants that continue to rely on coal are relying less heavily on long-term futures contracts and are instead demanding spot market transactions. Regional coal mining operations are finding themselves in a business ending sea of risk and the only way to escape is through expansion into international markets. Geographic growth is a major but necessary change for survival in today’s trading environment. Demand for coal is greatest in growing countries that need a cheap source of energy and feedstock for building materials to support their growth. Regions faced with relatively high natural gas prices and phase outs of nuclear power plants have also been clamouring for a cheaper source of power generation. This creates an excellent opportunity to profit; however, regional players must be prepared to manage a much more complex supply chain before they can enter international markets. Historically, one could argue that little more than a handshake solidified a deal between a coal mine and a local power generator. A short supply chain between a coal mine and a local power generator was easy to manage and quality concerns could be addressed quickly when they arose. International contracts tend to take quality extremely seriously. A mine owner must remain diligent in properly assessing the quality and location of a given stockpile. Similarly, a trader must know what stockpiles they can pull from, and when making deals each risks losing potential profit or facing severe penalties of the stock piles are not blended properly. In fact, the biggest penalties are issued when the wrong quality of coal is put on a vessel. Suddenly, a small regional operation will find itself with a new series of challenges that must be overcome before a contract is struck or a coal shipment begins its journey to the buyer. Logistics is probably the most complex challenge; however, it also represents the largest profit opportunity. International market success requires upstream and midstream coal participants to have better visibility into their end-to-end supply chain from pit to port and from port to end user. As the number of contracts and parties involved increase, the risk that a shipment will be delayed, arrive early or be otherwise unacceptable increases exponentially. A manual process to properly manage the risk associated with participation in today’s coal markets is beyond the capabilities of most organizations. Technology has become a key component and is needed to succeed. Triple Point Technology’s Commodity XL for Coal, Commodity XL Pit to Port, and Commodity XL PortVu help its clients mitigate commodity risk and optimize end-to-end supply chains. Rio Tinto, Anglo American and Vale rely on Triple Point Technology software to analyse data and distribute relevant information to the correct people so they can make profitable decisions. The following features are just some of the capabilities that organizations gain when they select Triple Point Technology as their commodity management and supply chain software provider. increase visibility across an organization granting the ability to react quickly and ensure efficient operations. gain further insight with 2D and 3D modelling of stockpile qualities and locations. Triple Point Technology® is a major global provider of on-premise and in-cloud Commodity Management software that delivers advanced analytics for optimizing end-to-end commodity and energy value chains. The company provides innovative solutions for managing all aspects of volatile commodity supply chains: trading, procurement, enterprise risk, logistics, scheduling, storage/inventory, processing, settlement, and accounting. Triple Point has customers in 35+ countries across industries including energy, metals, minerals, chemicals, agriculture, shipping, consumer products, food and beverage, retail, and manufacturing. The company employs staff in 15 offices and support centres worldwide. Euroports has four main coal cargo hubs in Germany, Italy and Spain. A consolidated volume of 1.9mt (million tonnes) of coal was handled at Marghera and Vado’s (Italy) Euroports terminals. Handling an average of one seagoing vessel of coal per week has made the Italian facilities main entry points for coal into Italy and its natural hinterland. In Tarragona (Spain), Euroports operates one of the most important maritime gates for this traffic at national level, with a dedicated coal terminal with a 700,000- tonne instant storage capacity; it is the largest terminal in the Mediterranean. TheRostock,Germany,facilitieshandle approximately 1mt of coal per year for the supply of local power plants. The company is further developing its services to secure its position as a maritime supply chain provider to the energy market. In Marghera,Venice, the annual handling capacity is about 500,000 tonnes per year. With a draught of 11.5 metres, the site is amongst the most competitive ports in the North Italian Adriatic range. That, combined with one of the fastest- discharging rates for coal (15,000 tonnes/day on average) allows for efficient handling of the vessels and quick turnaround times. The site offers value-added services such as screening of the product and arranges deliveries by train to end-users of the cargo. Transshipment of coal cargoes is also part of the services offered. To better meet safety and product quality requirements, a spray water plant with film-forming was installed on both cranes handling coal to reduce dust propagation according to environmental regulations in 2011. In 2013 an optimization of gate in/out delivery services was carried out, reducing truck lead times up to 40 %. Like this, not only is vessel handling fast, but the rest of the supply chain as well: storage, and loading of both trains and trucks. With future plans to expand yard capacity for coal handling, the site will remain one of the Mediterranean’s best entry points for coal products. At Euroports’ Vado facilities, a similar operation is present. There is an even greater vessel draught (12.5 metres — to be increased to 15 metres). Similar to the Venice operations, a dedicated area for coal handling is in operation to separate it from other product handling. In Vado the berth handling capacity can reach 2.5mt/year. Discharging speeds are the same as those in Venice. On top of that, the Vado facilities can offer discrete storage areas separating coal cargo per type depending on characteristics. A covered warehouse, with a capacity of 125,000 tonnes, is available for this. In 2014, the terminal in Vado will add screening operations similar to the Venice ones to its service portfolio. The increase of the draught to 15 metres will allow the terminal to accept vessels up to 100,000 tonnes coal cargo. It Tarragona, Spain, a draught of up to 20.5 metres allows the terminal to handle Capesize vessels (discharging vessels of up to 200,000dwt). Euroports is in a unique position in the Med, being one of the limited number of deep sea ports allowing this depth. Needless to say, many major coal importers are serving their customers and delivering to power plants from Tarragona. Excellent hinterland connections and seamless delivery services are a big driver in that. The site has its on train facility, and handles wagon, truck and vessel deliveries in a non-stop daily service. Loading, unloading, and transshipment operations are supported by dedicated equipment including gantry and mobile cranes, stacker with maximum height of 20 metres as well as 3.3km of conveyor belts. The terminal lives by the highest environmental standards, having installed water sprinklers as well as having implemented the use of surfactants as an effective means to avoid dust emission. Rostock has a draught of 13m, allowing the terminal to handle Panamax vessels. Its dedicated equipment enables high unloading performance of 20,000 tonnes per day (average) for its customers. Operations for coal handling are set up slightly differently. The customer can choose unloading operations that lead to direct unloading via gantry crane onto conveyor belt, with direct connection to the nearby power plant stock. Euroports offers the handling and operates the storage facilities and conveyors to supply the nearby power plant just in time from the coal storage. For this, a long-term partnership between Euroports and the power plant is in place. Further hinterland connections are also an option, with option to load onto truck and the availability of a wagon loading station. This is used for e.g. anthracite coal to supply a steel plant in the hinterland. © Euroports (article & photographs). Lawrence Industries, Inc. is a technical sales organization which represents a select group of US manufacturers that provide specialized products and services for the bulk material handling industry. Lawrence Industries specializes in TIVAR® 88 lining materials and services related to improving the flow of bulk solids in bunkers, bins, silos, hoppers, chutes, transfer points and transportation equipment. Lawrence Industries can develop solutions for improving operating efficiencies, production time and extending the service life of operating equipment with bulk materials such as coal, synthetic gypsum, natural gypsum, limestone, fly ash, bauxite, grain, sand, and lime. Lawrence Industries combines the latest in engineered materials, bulk solids analysis, geometric designs and manufacturing capabilities to develop cost-effective solutions for problems with bulk material handling such as ratholing, plugging, funnel flow, spontaneous combustion, surface corrosion, erosion and abrasion. Lawrence Industries specializes in the use and application of TIVAR 88 liners. TIVAR 88 is an industrial grade lining material that has been used in the coal industry for over 40 years. The primary use of TIVAR 88 liners has been to improve coal flow by reducing sliding friction. TIVAR® 88 has a lower coefficient of friction than 304 2B stainless steel and in slide abrasion applications can out wear carbon steel. The material release and non-stick properties of TIVAR® 88 make this an ideal lining material for bins, bunkers, silos, chutes, railcars, off road trucks and excavating equipment. TIVAR® 88 will help to eliminate problems with sticking arching, bridging, ratholing, plugging, carryback, spoilage, cross batch contamination and spontaneous combustion. One of the most common problems with bulk material flow is a condition known as ratholing. Ratholing occurs with cohesive bulk materials are stored and conveyed in vessels with a funnel flow discharge pattern. When a stable rathole develops the bulk material remaining in the vessel is stagnant and will not discharge. This stagnant inventory of bulk material can spoil, causing cross batch contamination, spontaneously combust and reduce live storage capacity. In many situations the condition of ratholing occurs because the wall surfaces of the vessel are not steep or smooth enough for materials to flow. This condition is highlighted in the picture below, which shows the rathole flow channel in green and the bulk material highlighted in brown. Above is an actual photograph showing a stable rathole developing in a coal bunker discharging Powder River Basin sub- bituminous coal. This pyramidal shape coal bunker built in the early 1950s was constructed of carbon steel and coated with gunite on both the vertical and sloping walls for corrosion protection. This high friction coating worked well, until the coal was switched from high sulphur bituminous to low sulphur sub-bituminous. The finer sub- bituminous coal with higher internal moisture and clay content flowed poorly on the gunite coating, resulting in pockets of stagnant coal, which then lead to bunker fires. An efficient way of achieving the reliable discharge of bulk materials in bins, bunkers, silos and chutes is to line the sloping wall surfaces of the storage vessel with a low coefficient of friction material.TIVAR® 88-2 is an ideal product for this application. The frictionalpropertiesofTIVAR® 88-2are consistently the lowest in the industry versus a wide variety of bulk materials, with surface lubricity lower than 304 2B stainless steel, baked on coatings, ceramics, chrome plating and sprayed on urethanes. The adjacent chart shows an example of the wall angles required to achieve flow discharge in a silo handling Powder River Basin coal. The lower wall angle provided by TIVAR® 88-2 means bulk materials slide or flow on shallower surfaces as compared to stainless steel. The wall friction angle data supporting this chart was generated using the ASTM test method D-6128. When mass flow discharge develops in a storage vessel the movement of bulk material is uniform and consistent. The flow pattern sequence shown to the right depicts how mass flow discharge would occur. this flow pattern is described as ‘first-in, first-out’ flow. When any material is withdrawn from the storage vessels all of the product is in movement and full live storage capacity is available. Mass flow discharge is ideal for bulk materials that are classified as non-free-flowing and susceptible to spoilage, cross batch contamination or spontaneous combustion. Coal handling applications for TIVAR 88 liners are many. The photographs above and right show the interior of a railcar rotary dump receiving hopper being lined with TIVAR 88 panels. The location of the two receiving hoppers is at a major public utility in the upper Midwest portion of the United States. During winter operations the utility experienced a condition in which coal being rotary dumped from the railcars would build a large eyebrow of coal on the spill side walls and center divider. This massive build-up of coal would bring dumping operations to a stand still and require the use of a hydraulic lump breaker (backhoe arm) to dislodge the build-up coal, in order to continue operations. The upper spill walls and centre dividers were constructed of concrete, which over years of wear had exposed the aggregate surfaces, adding to surface roughness and adhesion of coal. To expedite the installation process and remove the inconsistencies of the concrete surfaces,TIVAR 88 liners were pre-fabricated and attached to steel backer plates, which were then concrete anchor mounted to the hopper walls. After four years of continuous operation and over six million tonnes of coal transfer, the TIVAR 88 liners are still performing well with no signs of wear or dislodgment. Since the completion of the installation the use and maintenance of the lump breaker has been reduced by a factor of 75%, turn-around times for unit train deliveries has been increased and plant operations considers the capital investment to have been a complete success. The new-generation DL420-3 large wheel loader from Doosan Construction Equipment is designed to set new benchmarks for exceptional performance, ease of handling, serviceability, durability and significantly enhanced operator comfort. With a bucket capacity of 4m3, the new DL420-3 wheel loader is intended to meet a wide range of material-handling needs from loading and transporting granular material (such as sand and gravel) to industrial, mining and quarrying applications. The DL420-3 wheel loader is powered by the 13-litre Scania DC13 SCR 6-cylinder diesel engine delivering ‘best in class’ power and engine torque, with a maximum power output of 264kW at 1,800rpm and meeting Stage IIIB emission regulations through the use of SCR (selective catalytic reduction) technology. Part of the new family of Stage IIIB compliant large wheel loaders from Doosan, the new DL420-3 wheel loader combines high engine power output and SCR technology with a new ZF transmission and several other features to minimize fuel consumption. SCR technology reduces fuel consumption by about 10% compared with similar size machines with EGR technology. Resale is also better as it is easy to reset to Tier 2 engines for use in emerging markets. The new ZF 5-gear transmission improves the transfer of power from the engine to the wheels and contributes significantly to the overall reduction in fuel consumption. The change from four to five gears provides better response and acceleration, especially on slopes. Engine speed variation is less thanks to smaller gear steps, and lower engine speed throughout the whole drive range reduces fuel consumption. Thanks to higher shift quality, noise levels are lower while driving performance and productivity have been increased. A lock-up-clutch also helps to reduce fuel consumption. The new large wheel loader has three engine working modes: ECO, NORMAL and POWER, to adapt the machine to different applications, with different engine speeds and gear steps according to the working mode engaged. With the ‘power-up’ function, the operator can manually adjust to the next highest working mode by applying a full stroke of the accelerator pedal. With this function, the operator can travel in moderate NORMAL mode and switch to POWER mode when it is really needed, such as when taking material from a pile. This capability helps to reduce fuel consumption. The ECO Bar provides information about fuel consumption in relation to machine performance in real-time, allowing the operator to select the driving profile for the best fuel efficiency. The operator can set a password for machine start. If Auto Idle is activated, engine speed goes down about 200rpm after ten seconds if there is no machine movement. Auto Idle is ideal for applications with long waiting times, such as truck loading. Thanks to Auto Idle, fuel consumption is reduced by up to 8%. New ZF limited slip Type II differential axles provide more durability and a longer lifetime. Rolling resistance for the axles is also reduced, improving traction and decreasing fuel consumption. As an option, customers can choose ZF axles with a hydraulic differential lock. This function is engaged via the operator pedal or in automatic mode, depending on the torque resistance in first and second gear. The advantage of the hydraulic lock system is that it has less rolling resistance compared to the limited slip system. All new-generation Doosan large wheel loaders are equipped with a torque- converter-cut-off (TCCO) system which, when activated, switches on automatically. This provides a direct mechanical connection between the engine and transmission without loss of power and torque by the torque converter. Tests show that fuel consumption is up to 10% lower with increased traction compared with conventional systems. In contrast to the drive systems on other machines, the TCCO can be engaged even in second to fifth gear, not just in the highest gear. This makes the TCCO more efficient. With the clutch cut-off system engaged, the driver is able to disconnect the transmission from the engine by operating the brake pedal, to have 100% engine performance for the hydraulic system. As a result, movements are faster, breakout force is maximized and fuel consumption is reduced. In common with all new- generation Doosan large wheel loaders, the new DL420-3 model is equipped with load-sensing controlled, variable hydraulic piston pumps, improving performance and reducing fuel consumption. With load sensing, the hydraulic pumps receive a signal from the MCV informing how much oil is needed. This helps to save on engine performance. The radiator fan is hydraulically driven and controlled by an ECU. Changing the fan direction for cleaning the radiator can be done manually from the cab, without having to switch off the engine. Fan reverse intervals (30 minutes to 2 hours) can be set via the menu. A new cab design features improvements both outside – such as better visibility due to a wider front glass section and an extended wiper blade area, better protection thanks to larger mud guards, improved hand rail and step designs and a new roof cover — as well as inside — such as the new instrument panel with integrated vehicle control unit (VCU). The control panel has been redesigned to allow the operator to choose the information they want on the display. Using the Main Menu, the operator has access to several functions and machine information. Pressure, temperature and engine speed can be monitored in real time. Detailed operating information is available via the Special Menu. By relocating the reservoir for the wiper water to the outside of the cab, space inside has been increased, providing more foot room.The air conditioning system is regulated automatically by a temperature sensor. To keep cans and food fresh, a new cooling compartment is standard. There is also more storage room behind the seat. Like all Doosan new-generation large wheel loaders, the DL420-3 model has as standard the SKF Vogel Auto Lubrication system. This system increases operational hours and extends the lifetime of the machine. The lift arm has been strengthened with 10% thicker metal in the arm and the tilt lever. An automatic front control system allows the operator to save one low and one high position. The boom raise ‘kick out’ function reduces cycle times and increases operator comfort. ‘Return to dig’ positions can also be saved. New kinematics and a larger cylinder on the lift arm have allowed the main pressure in the front hydraulic system to be increased by up to 70 bar, with a corresponding increase in breakout and lifting forces of up to 5%. A larger opening angle for the side door improves serviceability. A 90° swing-out fan with swing-out side doors provides easy access to the rear for cleaning the new one block radiator. The operator can set and monitor the time remaining to the next service. If the maintenance period is exceeded, a pop-up warning will appear. Increased space in the engine compartment ensures that components such as filters, valves and batteries are within easy reach for service work. Understanding your coal quality and sampling representatively is essential to eliminate penalties and maximize profits. SGS works hand-in-hand with its customers’ operations to generate cost- effective solutions for quality and address operational challenges. SGS offers the highest levels of integrity, independence, impartiality and accuracy. Its services and industrial expertise help improve operational efficiencies and its global technical leadership helps minimize customers’ operational and financial risk. The company’s experienced staff are able to provide sampling, inspection or laboratory services, mechanical sampling systems, on-line analysis for blending and sorting support. The value of a coal cargo is determined by testing a sample collected manually or by a mechanical coal sampling system. If the sampling method or the sample preparation is biased or inconsistent, the value of the cargo can be inaccurately or imprecisely determined. This results in the cargo being over-or under-valued and transaction is then unfair to either the buyer or the seller. Costly decisions are often made based upon biased, incorrect, or erratic data. Coal is often a difficult material to sample because of its inherent heterogeneity with in its inorganic and organic constituents. It can be widely variable with respect to size and chemical composition, varying in moisture, ash, and sulphur content in addition to its heating value. The process for determining the quality parameters such as gross calorific value (GCV) of coal begins with sampling, a process that requires adherence to established rules and guidelines given in ISO,ASTM and other published standards. The processes of sampling and laboratory analysis provide valid estimates of the desired quality parameters. There are, however, uncertainties associated with each such estimate. Sampling statistics can often provide a means of calculating this uncertainty and a way to evaluate the risks associated with the use of the sample results. The minimum mass of the gross sample should be sufficient to ensure that extraneous mineral and coal particles appear in the sample in the same proportions as in the lot from which the sample was collected. Sampling standards provide minimum numbers of increments to be collected at each stage of sampling. Attention must also be given to sample flows through the system so as to minimize the potential for sample moisture losses. SGS has years of experience in sampling and is a leader in the field of bulk material dynamic sampling theory. Proper sampling is the first critical step in determining the value of a cargo. Risks associated with inaccurate sample results are minimized by utilized a well-designed and constructed mechanical sampling system (MSS). Such a system, well operated and monitored, will consistently provide accurate quality data. Mechanical sampling is generally preferred over manual sampling. There is no human discretion involved in MSS, and the MSS will collect increments from any part of the lot. MSSs can be expensive to purchase, install, and maintain, but the increased reliability, accuracy and precision are well worth the cost, especially if large amounts of coal are handled. Use of an MSS must include an on-going quality assurance programme, including monitoring of the sampling ratio. The system should also be periodically bias-tested to assure bias-free performance. To design a mechanical sampling system requires determining the number of primary increments and the mass of the increments required for the lots being sampled.ASTM D7430 (which replaced D2234 in 2009) and ISO 13909 define the standard practices for collection of a gross sample of coal with a mechanical sampling system. ASTM and ISO standards provide general purpose procedures to determine the number of increments required when sampling lots of coal based on: lot size, variability, sample preparation and sample testing. If desired, when the precision for a design system is unknown, these standards provide factors for raw data. In addition, these standards allow for studying the variability of the coal. The data is used to calculate the number of increments needed to attain a given precision. As clients become more informed about the need to meet specific precision requirements, they are more willing to determine the variability of the material and designing systems to meet specific minimum precision requirements. Using a proven procedure, SGS can determine the number of primary increments and sub-lots needed to obtain objective levels of precision. This entails use of applied statistics on data collected from stopped-belt sampling and data obtained from duplication of preparation and analysis of these stopped belt increments. SGS develops the extraction data for the system which defines all system design requirements from samplers to feeders and crushers. Extraction calculations also provide the basis for the on-going sampling ratio monitoring of the system, which assures proper on-going system performance. When initially designing the sampling system, all required capabilities must be considered. Initial questions that must be addressed include: o is it possible that an on-line analyser will be added in the future? o are samples required for a product size determination to be made? ASTM and ISO recommend that the systems be designed so that the sampling system precision can be tested. These are decisions that must be made by the customer, but they can have a big effect on layout and equipment selection. While the objective is always to minimize costs, a well designed sampling system will result in the lowest cost possible. SGS engineering services define the trade-offs between capital costs and operation costs and availability and allow you to make informed decisions. Design of chutes and material flow systems to allow hard-to-handle coals to be sampled without problems is another function critical to providing a satisfactory system. SGS uses the latest in 3D CAD software to develop layouts that work to the customer’s unique site requirements. SGS’s ability to generate detailed renderings helps in the presentation of concepts to non-technical audiences as well as allowing the engineering team to evaluate the constructibility and operations issues in the proposed design. The minimum standards for the equipment must be specified. In sampling equipment the first consideration is to avoid bias. A sample system should be tested to be free of bias and in the specifications a guarantee of no bias must be specified along with a description of the bias test procedure that will be used. There are critical equipment design issues that need to be met to allow a system to sample coal free from bias, such as minimum material flows through crushers. Part of the equipment specifications address access to allow the inspection and maintenance operations to be performed easily to ensure good system operations. Also the mechanical requirements of the system will be addressed to ensure long term performance. The minimum drive motor size, activation method, brake sizing and types are recommended. In addition to equipment specifications, P&ID diagrams and basic PLC programming needs are specified. Also, acceptance test criteria for the systems will be defined for bias tests, sampling ratio tests and other acceptance tests. SGS provides an itemized budget estimate for the project. This is not for the bidders on the sample systems but for the information of the owner. The budget estimate will contain a list of options so its customers can explore additional capabilities while understanding the cost implications. The final product from SGS will have a specification to which the customer can add general terms and conditions, safety and site-specific requirements. SGS normally uses its customers’ standard painting, electrical, and structural specifications. For an MSS design, detailed information is needed about the sampling location, the material to be sampled, including its top size, surface moisture content and material handling characteristics. An engineering site visit is required to assure the ultimate design will meet ASTM, ISO or other specific specifications and be suitable for the intended use. reliability, expense, and practical operational considerations must be optimized. SGS has over 25 years’ experience designing, installing and commissioning client-dedicated, site-specific mechanical sampling systems. There are over 300 SGS-designed systems operating in more than 20 countries worldwide. Experienced SGS sampling technicians, familiar with industry standards related to proper operation of mechanical sampling systems, are located in all major coal producing areas. Terex Fuchs mobile loading machines for port handling make it possible to load and unload quickly, with the greatest precision. Over time, the company’s innovative machines have been precisely adapted to the requirements of modern port logistics, and are particularly popular for handling coal. As tireless and highly efficient work horses, they give excellent performance for flexible as well as customized requirements for port operation. A big grab, enormous working radiuses, and extremely short loading ranges when used at full throttle — with these advantages,Terex Fuchs modern power packages are an ideal interface between ships, trucks, trains, conveyor belts, and storage areas. The Terex Fuchs loading machines are sought-after top performers for bulky goods handling, especially when handling coal — not only because of their height-adjustable cab, but also due to their numerous outstanding features, their incredible performance and robust nature. A heavy duty design, soft hydraulics that can be precisely controlled, and high stability make a superb combination. The in-house Application Center, where the machines can be adjusted exactly to the customer’s requirements, ensures a high-level of flexibility for customizing the machines. The Terex Fuchs loading machines immediately show their strengths in the customer’s application. Bulk Connections, a bulk cargo handler in South Africa and part of the market-listed Bidvest Group, handles a wide range of sensitive cargo, but with a focus on coal. The bulk material terminal in Durban port was established in 1907 for coal export. Since then, the terminal has increasingly specialized in handling bulk goods. Loading ships with manganese, coal, and anthracite coal and unloading coke are particularly important to the companies. Over 3mt (million tonnes) of bulky goods are loaded annually over the quay walls of Bulk Connections to Panamax and Handysize ships. Bulk Connections’ management team has opted for two Terex Fuchs RHL380 crawler loading machines. Equipped with 8m3 clamshell grabs, the machines with a service weight of around 70 tonnes and a reach of 22m are the most flexible top performers in Durban port. The RHL380 also offers excellent stability on uneven ground thanks to the large undercarriage with big crawlers. Due to the crawler design they can also work on the quay walls, as the crawler units distribute the pressure optimally and transfer it into the ground. Up to 1,000tph (tonnes per hour) of coal are transferred per machine from the storage yard on to the conveyor belts to prepare the ships for export. Unlike conventional devices, such as cable cranes or portal cranes, both the Terex Fuchs machines are easy to operate and can quickly move forwards and backwards on the operation site. With the high-performance hydraulics system that responds accurately, loads can be loaded precisely into the hold of a ship or into the storage area of a railway wagon or truck. “The investment in Terex Fuchs loading machines has set new standards for production in our companies and they have added to the overall flexibility of the terminal. There is undoubtedly sufficient demand for this type of machine, which, thanks to sensitive control, even enables us to move the load safely and very quickly without swinging or disruptions to production in high winds. “Thanks to the enormous reach of the machines, we can pile up the raw materials high, thus avoiding the use of other hydraulic excavators on different levels. We have been able to replace three machines just on the Durban site, and are therefore not only saving fuel, but can also stack cargo in the same amount of time as before. It was the right decision for us to considerably increase our capacity thanks to these machines. Our company has bulk facilities in South Africa and, for some years now, in Mozambique, where Terex Fuchs loading machines are used individually, without being modified, to load the trucks, move them to the operation site and operate them. This gives us the opportunity to react quickly and flexibly and therefore to compete in the market,” states the managing director of Bulk Connections, Iain Geldart. New Year, new products: the Edge material handling range has just got bigger. Edge has recently unveiled the newest member of its ‘family’ — the RS1500 roll-sizer. Building from the success of new products launched in 2013 such as the Slayer XL, the MS100 and the 360° Unlimited range, the company has no intention of resting on its laurels. Each new product launch has contributed in its own right to Edge’s success. With a number of new R&D projects ongoing, Edge anticipates further growth in 2014. It is with this in mind that the Edge design team set out to design the most efficient mobile mineral sizing solution available on the market today. Through extensive research, testing and the use of high quality components, it believes that it has been able to deliver on that target. Innovatively designed, the RS1500 can process a wide range of materials including coal, lignite, bituminous, sub-bituminous hard-to-handle materials — graphite electrodes to sticky materials, friable materials, soft ores, limestone and limes, salts, glass, fertilizer, recycled concrete and tarmac. Its robust design, coupled with high manoeuvrability and small footprint, all ensure that the RS1500 is a formidable option for the quarrying and recycling sectors. Boasting an impressive list of design features — including a highly efficient hydraulic drive system, tramp metal release, easy selective piece sizing controls, intelligent hydraulic load sensing system and a five function remote control — the RS1500 is packed with the most up-to-date technology and components. The full HMI (human–machine interface) controlled panel interface provides easy fine tuning for accurate application performance. The HMI allows for automatic start/stop operation and displays visual data output such as engine load, individual shaft pressure, hydraulic oil temperature and fuel consumption while the machine is still operating. The unit is powered via a Caterpillar C9 260Kw (350HP) designed to suit Tier IV regulations. The C9 engine offers full orque whilst only consuming 25–30 litres (6–8 US gallons) per hour. The RS1500 has the capacity to process 250 tonnes per hour (276 US tons) with a maximum feed size of 400mm. Material is fed into the RS1500 7m3 (9 square yards) hopper and is carried to the pre-screen via the 1,400mm (55”)-wide heavy duty belt. Full length impact bars prevent sag, reducing material roll back and taking impact from feeding material, prolonging the life of the conveyor belt. Variable belt speed controls the flow of material to pre-screen. The feed hopper boasts a hydraulic sliding function to enable quick transition from transport to operating position. A single deck, two-bearing pre-screen allows fines to by-pass the chamber, increasing processing efficiency and throughput. An easily retrofitable optional side conveyor is available to stockpile diverted fines separately. The roll-sizer chamber has the ability to handle wet and sticky material and employs an intelligent load sensing system to prevent overload. The tooth rotor design allows undersize material to pass through the precision designed shafts increasing product throughput. The shafts are designed to grab the feed material and reduce it to the desired product size whilst creating the minimum of fines. The RS1500 incorporates an automatic sensing system that protects the roller shafts against tramp metal or trapped material. This vitally reduces maintenance costs and downtime. The chamber houses two variable speed, reversible roller shafts for accurate piece sizing both of which are independently driven and controlled via the HMI control panel. Piece sizing is also easily adjusted via the control panel. The feedbox enclosing the chamber not only acts to feed material from the pre-screen into the chamber, but also prevent debris and dust from exiting the chamber. Removable plates are provided to gain access to the chamber for maintenance when and as required. Material is stockpiled via the 1,150mm (46”) wide, heavy duty ply product conveyor which provides a discharge height of 3,560mm (11’8”) creating a stockpile volume of 77.5m3 (101 square yards) or 125 tonnes (138 US tons). Impact bars underneath the chamber take the impact from processed material, prolonging the life of the conveyor belt. The hydraulic folding head section allows for quick transition from transport to operating position. With its impressive cubical piece size, minimal fines produced, low power consumption and high tonnage per hour, the Edge RS1500 is the most sensible option for many applications. The company will be showcasing its products at the CONEXPO exhibition, which will take place from 4–8 March this year in Las Vegas. With new products in the design process, and the ever-growing options available, Edge is staying true to its ethos of ‘Innovation at Work’. Conductix-Wampfler is part of the Delachaux Group, founded in 1902. The company specializes in the design and manufacture of power, data and media transfer systems for mobile applications. Active on every continent, the company has centres of excellence, responsible for production, R&D, engineering and central support functions located in Germany, France, USA and Italy, with dedicated production centres in Ireland, India, UK, China, Australia and Brazil. Conductix-Wampfler’s activities are market driven, with the emphasis on five focus markets; Mining & Bulk Material Handling, Ports and Container Handling,Automotive Industries, Intralogistics and Overhead Cranes. The company also works in other markets, such as theatre and stage, people carriers/transit, offshore and construction. Conductix-Wampfler is heavily involved in coal handling systems, which comes under its Mining & Bulk Material Handling focus market. The company is able to accommodate the full range of movements required by today’s heavy duty coal handling equipment, supplying solutions for stacker & reclaimers, stockyard cranes, ship loaders/unloaders, car dumpers and tripper conveyors. Handling the robust, heavy cables and hoses required for modern coal handling systems is no problem to the Conductix-Wampfler range of motor-driven and spring cable reels, heavy duty festoons and energy guiding chains. Long/gantry travel can be accommodated by a range of solutions, from large level wind reels handling over 2,000m of cable, through monospiral, 3–2–3 and random winding drums for shorter run lengths. When combined with the Conductix-Wampfler fibre-optic rotary joint, the systems are able to utilize combined power and fibre-optic cables, which have the ability to transfer large amounts of data quickly and efficiently. Conductix-Wampfler produces reels with a wide range of powering options, from the company’s patented MAGdrive magnetic coupler, through torque motor, hydraulic and variable- frequency drive systems. The reels can be supplied with an impressive range of slip ring and fluid rotary joints, able to handle voltages up to 36kV and pressures of over 400 Bar. Cables and hoses are sourced from premium suppliers, with many of them made to Conductix-Wampflers’ own design. Steel energy guiding chains are especially suitable for multiple cable/hose requirements on car dumpers and for slewing motions on a variety of equipment. Available in hot dip galvanized or stainless steel, the chains can also be supplied with ATEX certification. Where infinite rotation is required, Conductix- Wampfler can supply slip rings and fluidic rotary joints. With ingress protection up to IP67, and with ATEX 21 and 22 certification available, the units are able to handle most of the environmental requirements seen in the coal handling world. Coal handling equipment demands robust solutions, providing high machine availability and low maintenance; the Conductix-Wampfler range fits the bill, being designed and built to withstand the aggressive environment of dust, water, salt and high/low temperatures common in this market. luffing stackers, two bridge reclaimers and two stacker/reclaimers will be supplied by its sales and marketing organizations in India and Australia and will be designed for use on machines handling a range of materials, including coal. The sales and marketing organization of Conductix-Wampfler Australia has also had recent success at Wiggins Island Coal Export Terminal, Dalrymple Bay Coal Terminal and at Caval Ridge yard, supplying level wind cable and hose reels, mono-spiral cable and hose reels and energy guiding chains, as well as the cables and hoses to suit. The trust shown by these major operators demonstrates their belief in Conductix-Wampfler’s capabilities. With more than 80 years’ experience in this field, customized products to meet customer needs and a global network for first class back-up, it is a fact that Conductix-Wampfler can help you ‘move your business’. The importance of coal as a global commodity cannot be overstated and Inspectorate International is an integral part of the supply chain, protecting its clients’ commercial interests. As regular readers of DCi will know, Inspectorate is now part of the Commodities Division of Bureau Veritas, one of the largest inspection and certification companies in the world. The Coal Business Line had another busy year in 2013, with major coal-handling centres and coal laboratories being commissioned and upgraded around the globe. At ports across the world, Inspectorate’s inspectors are involved in sampling, testing and draught surveys. Recent examples of barge fires in Rotterdam are clear examples of the potential hazards. Similarly coal piles can overheat and need the expert knowledge that the company provides. In the UK, Inspectorate has just finished commissioning a new coal preparation and testing facility at the Humber International Terminal (HIT) in Immingham. The sampling and preparation will be fully consistent with ISO 18283:2006. The new facility will be operational from 1 February 2014, being staffed with Inspectorate employees and equipped with two QHS Hammermill crushers, a Retch SR300 Rotormill, drying ovens, and Gilson riffle dividers. From the initial bulk sample of several tonnes, the facility can rapidly produce representative laboratory samples of <0.2mm to test the coal quality for Inspectorate’s customers. Erwin Oosterveen, the company’s Solid Fuels Business Development Manager for UK and Northern Europe, said: “ This major new development in on-site sampling should be tremendously helpful to the industry. It’s a one-stop-shop for the energy industry that is convenient and quick. And that’s all backed up by the accuracy of testing and analysis for which Inspectorate International is renowned. “Our new Immingham facility complements Inspectorate’s existing large global network of coal and solid fuels sampling and testing facilities.The facility means we can now offer an end-to- end service to clients importing these products into the UK from all over the world. “In time we can see the facilities we offer being extended to cater for more industry needs. Our main aim now, however, is to make sure that the new service gets off to a flying start. We are confident that it will and look forward to proving ourselves to clients,” says Oosterveen. During the first quarter of 2014, a new coal testing facility will be added to the already comprehensive analytical and testing services provided at Inspectorate’s Witham Laboratory Facility which is located just outside London, in Essex. Elsewhere in Europe, Inspectorate International serves the key European ports of Amsterdam, Rotterdam, Antwerp and German ports intensively. It inspects, tests and certifies in the region of 500mt (million tonnes) of material a year globally. Over in the USA a new Solid Fuels Technical Centre has been established near New Orleans, which handles met coal, thermal coal, pet coke and wood pellets. As the world looks for new sources of renewable energy, the inspection of wood pellets and other bio-mass products for the energy industry is becoming increasingly important. The La Place facility has a fully-fledged sample preparation area, for crushing, grinding and dividing bulk samples for analysis, with drying ovens for bulk and semi prepared samples. The fully equipped laboratory performs analysis of physical and chemical parameters, i.e. proximate; total sulphur; calorific value; hardgrove grindability index; ash fusion temperatures; carbon; hydrogen; nitrogen and particle size distribution, whilst ICP analysers are used for the determination of trace elements in various sample types. The laboratory performs tests according to recognized international standards (ISO/ASTM) and is in the process of attaining ISO 17025 accreditation. In Colombia, Inspectorate International operates CMC’s laboratory at Puerto Bolivar. A brand new laboratory has been recently established at Cienaga, to test coal exported from other nearby Colombian ports. The company estimates that it is responsible for dealing with the testing of around 60% of Colombia’s export market, which totalled some 82mt in 2012, according to the World Coal Association. Inspectorate International has a presence in all the world’s major importing and exporting countries. One of the largest operations is in South Africa at Richards Bay, where it runs the coal testing laboratory for the RBCT (Richards Bay Coal Terminal) shareholders, testing about 70mt of thermal coal, actually twice — once for rail deliveries into the port stockpiles and then again on to the vessel exporting to consuming countries. Inspectorate’s African operations have grown extensively over the last two years with new high capacity exploration testing laboratories being constructed in Middleburg and Centurion. In addition, facilities have been built and extended in Mozambique to accommodate the coal testing and certification requirements of this new coal-exporting nation. There are also major facilities in Eastern Europe, including Russia, where there are laboratories in Kemerovo, St Petersburg and Murmansk, and a brand new facility has been built in UlaanBaatar Mongolia. Andrew Mynn, Global Vice President – Coal said: “Our new facility in Mongolia is a state-of-the-art facility that has been built specifically to test borecore exploration samples from the vast deposits of coal that are now being extensively explored for the firsttimeinMongolia. Explorationtestingallowsthequalityof the coal in ground to be determined and how this can be best mined and beneficiated to make the best possible saleable products for the mine owner. This facility complements our other dedicated exploration testing facilities in Australia and Africa.” Bureau Veritas/Inspectorate International are also responsible for a considerable proportion of the coal inspection business in Australia. The main laboratories are in Brisbane, Newcastle, Gladstone and Mackay, with satellite laboratories around the country, including Blackwater, Emerald, Moranbah and Singleton. In Southeast Asia, Inspectorate has a considerable presence in Indonesia, which is the world’s largest exporter of coal, particularly steam coal. Five newly established laboratories are fully engaged in coal testing in East Kalimantan. Inspectorate International anticipates further expansions in its coal services platform in 2014 as it looks to continue to deliver world class testing facilities to its customers all over the globe. As one of world leading suppliers of materials handling equipment, and with over 100 years’ experience,ThyssenKrupp Industrial Solutions, Business Unit Resource Technologies (TKRT, formerly TKF) has developed a complete range of products for bulk terminals, stockyards and coal-fired power plants. Recent technical achievements and contracts highlight TKRT’s development work for coal handling in terminals and power plants. From 1999 to 2008 ThyssenKrupp successfully supplied more than 18 high capacity shiploaders for ships up to 200,000dwt, with capacities of 6,000–8,000tph (tonnes per hour). It also delivered more than 12 high capacity car dumpers to the ports around Bohai Bay of Northern China, the most important China’s coal terminals. This success story continued with the award for a further four shiploaders and two quadruple car dumpers, which are proven to be the largest in China. At the end of 2013, two milestone contracts were awarded to ThyssenKrupp for the design, supply and installation of four 6,800tph shiploaders and two car dumpers for coal by Huaneng Corp. China for its new coal terminal, Caofeidian No. IV Coal Terminal. The award of the contract for two quadruple car dumpers by Huaneng Corp. China for its Caofeidian IV Coal Terminal is a breakthrough achievement for TKRT in China for this kind of car dumper, and follows on from the success story in China back in 2000. The expansion project will enable Huaneng Group to export 40mt (million tonnes) of coal each year. Each new car dumper has the same unloading capacity as the existing one, but with increased capacity of hauling railcars of longer and heavier trains arriving at the port. Each car dumper will simultaneously unload four rail freight wagons, each weighing a maximum of 100 tonnes, at a rate of up to 28 cycles per hour, thus unloading an average 8,000 tonnes of coal per hour with a maximum capacity of 8,600tph. The systems are equipped with a positioner to position the wagons correctly, wagon weighbridges, hoppers, discharge feeders and dust control systems. The new car dumpers will be designed on the basis of the car dumpers built for China since 2000. However, there will be significant improvements in the hydraulic system, and special mechanisms for the rotor and drives and in the environmental facilities. These measures will ensure high reliability and performance, enabling an annual throughput of 40mt using only two car dumpers. In 2015, both car dumpers will be installed, commissioned and put into commercial operation in the terminal. An annual throughput exceeding 100mt will be reached, using the company’s own railway and unloaded by the eight car dumpers supplied by TKRT. TKRT’s China success story continues with the award for a further four shiploaders, the largest ones in China. These machines are designed to load ships at a rated capacity of 6,000tph (max. 6,800tph) and ship sizes up to 150,000dwt. They are equipped with portal travel gears, boom with shuttle head and a loading device with trimming spoon, which allows 360° slewing. With this option, it is possible to achieve homogenous filling of the corresponding ship holds up to the uppermost edge, at a high nominal loading capacity. All mechanisms including those for the belt conveyor are equipped with variable-speed drives by means of frequency converter. A modern drive control and PLC system is incorporated in the shiploaders; operation is mainly controlled via the computerized operator’s panel in the operator’s cabin. The high degree of automation and the visually assisted operator’s guide in Chinese allow the operating staff to operate the machines easily and in a comfortable fashion. For environmental protection, a water spray dust suppression system is installed with a suction pump, water tank, spray pressure pump and spraying nozzles for all transfer points and the loading spout and cleaning compressed-air line. Special measures are also taken in the design to the transfer points and materials flow for a better and functional sealing of the chutes and skirting. These giants are expected to be commissioned in 2015, readying them for entry into commercial operation. The Tanjung Bin No. 4 Power Station, an expansion of the existing power plants with three 700MW blocks — one having one 1,000MW modern unit — is situated besides Tanjung Bin Power Plant 1–3. Again, as with the Tanjung-Bin and Jimah Power Plants between 2005 and 2008,TKRT and its partner,TKIIL (ThyssenKrupp Industries India) have been awarded a follow-on contract for the coal handling plant for the newly built power station block 4.
crusher and screens; and v overall electrical and control system for the automatic operation of the coal handling plant. All of the tailor-made equipment and machines in this coal handling system will be supplied by TKIIL and TKRT itself using the latest bulk handling technology, and taking into account the high performance, efficiency and availability requirements. It will also offer a high degree of automatic operation and environmental protection against dust and noise emissions, which are necessary in a modern power plant. The materials will be taken from the existing conveyor system at the connection point and delivered to the stockyard. The stockyard will have four stockpiles, for the different sorts of coal, which will be served by three identical combined bucketwheel stacker/reclaimers. The coal yard has been designed to carry out simultaneous receiving and reclaiming of material, which means one machine will do the stacking, while the other two are reclaiming. In order to achieve the best simultaneous operation with the optimum use of the stockyard area, the boom length of each stacker/reclaimer will be 46.5m. retractable tripper car and intermediate conveyor. An HMI (human–machine interface) panel will constantly inform the operator of the operating condition of the machine. A communication system between the operator’s cabin and the central control room of the loading and unloading plant will ensure a fast exchange of information and therefore an economic use of the machines. During manual operation, the operator controls the individual motions from the driver’s cabin. In automatic mode, all operating sequences are carried out automatically. However, this is only possible after manual selection of the stockpile area and height and during reclaiming, after the first cut across the pile has been carried out. To achieve the required blending effect, the reclaiming rate of each machine will have an accuracy of 0.5% for the range of 30–100% capacity. In 2013, site construction began and the CHP will be ready for commissioning and putting into operation 2014. There is no doubt that this outstanding reference and the previous reference for the Tanjung-Bin and Jimah power plants will enhance TKRT’s chances for further contracts, especially in this part of the world. Increased demand on the world coal market is leading to an increase in Russian coal production. In order to handle this increase in the ports, all major coal producers are investing in the infrastructure of their port handling facilities. One of these ports is Posjet Port, located in the very far east of Russia, close to the Chinese and North Korean borders. From this location, one of the important players on the coal market, Mechel Group, handles bulk coal shipments to Japan, Korea and South East Asia. To increase its competitiveness in the market, the Mechel Group is investing heavily in the upgrade of Posjet Port and contracted TKRT for engineering and supply of all necessary bulk material handling equipment for the upgrade of the port. The scope of work comprises delivery of railcar unloading facility (twin side discharge tipplers) unloading simultaneously two railcar wagons, one transfer car, two bucket-wheel stacker/reclaimers, one shiploader, crushing- and a complete conveying system, including all galleries, transfer towers and conveyor bridges. To protect the environment, special requirements had to be taken into consideration when designing and configuring the handling system, in particular in terms of environmental protection against dust and noise emission. The handling capacity of the equipment is designed for 3,000tph, with an overall handling capacity of 7mt per year. The current handling capacity is between 2–3mt a year, so the port expansion will increase capacity by more than 1.5 times. TKRT is one of the few suppliers in the world to be able to cover the complete production programme, all of the handling facilities in the port system will be based on TK’s expertise. The client can therefore rely on a tailor-made system from a single source. Currently,TKRT is assisting the Mechel Group with the construction of all necessary bulk material handling equipment, and the coal terminal is taking shape and will ready for operation this year. high throughput of wagon unloading shall be achieved; TKRT has therefore developed a ‘Twin Side Discharge Car Dumper’ design, to be used on one railway line, for this special case. The twin side discharge car dumper for wagons with a payload of 75 tonnes offer a maximum cycle time of 2 × 20 wagons per hour, achieving maximum capacity of 3,000tph. This is the highest capacity ever built by TKRT for side discharge car dumpers. As a major supplier of dust control systems for the coal handling industry, Dust Solutions Incorporated (D.S.I.) has seen a significant increase of customer inquiries from port facilities. This may be in part due to the shifting focus of anti-coal organizations which are targeting coal import/export facilities as part of their efforts to reduce use of carbon based fuels. Government regulators are responding to increasing pressure from these groups to write ordinances to reduce the environmental impacts of material handling and storage. At this writing a major city in the United States has proposed strict requirements for controlling dust from stockpiles as well as specific control measures that must be in place. One of these control measures is to require the use of wind fences to prevent wind from carrying dust off site. WHAT IS A WIND FENCE? A wind fence is typically defined as a porous structure (usually a porous fabric mounted to column supports) that is placed on the upwind side of the area that one is trying to protect from the wind. To be effective, the fence must allow a certain percentage of wind to bleed through the fence to equalize the pressure differential on both sides. The definition of wind is the movement of air from a high-pressure zone to a low-pressure zone. Equalization of air pressure reduces the air velocities. By allowing some air to bleed through, the higher speed winds are deflected away from the downwind storage area as the wind then ‘sees’ medium air pressure already present at the stockpile location. The end result can be wind reductions of over 50%. Trees are natural way of creating these same phenomena and have been used for centuries in the agriculture industry to protect farm fields from damaging winds that cause soil erosion. However, trees take years to grow and require site conditions where they can live (most coal yards are not plant friendly). Dust Solutions DustTamerTM Wind Fence System uses a specially engineered fabric that is knitted from industrial grade woven polyester, resistant to UV rays, inclement weather and temperature extremes. It comes in two porosities to best meet site specific requirements of fence height and coverage area. Its unique ability to be tensioned prevents ‘flagging’ of the material and consequential damage due to abrasion that lesser fabrics are subject to. Real world applications over the last 30 years have shown that DustTamer can withstand winds in excess of 100 mile per hour with no damage. Another important feature of DustTamerTM fabric besides its strength and durability is its ability to not plug with dust, debris, snow and ice. This self-cleaning feature is due to its ribbed and slotted design. Horizontal ‘ribs’ provide the structure and vertical filaments joining each rib provide the porosity. DustTamers vertical filaments stay loose and move around to release materials that can plug a basket weave type of fabric. This ‘self-cleaning’ feature is very important as it prevents the issue associated with using basket weave pattern materials. If the fabric plugs two things can happen: 1) Plugged fabric prevents the bleed through effect that is necessary for wind reduction so the benefit is lost. 2) If the material is plugged the fabric and the structure will receive higher wind loads than when clean, possibly resulting in either fabric or structure failure in high winds. WIND SCREENS COMBINED WITH DRY FOGTM DUST SUPPRESSION SYSTEMS DustTamer can be used for protecting conveyors, dump and grab hoppers from blowing dust as well. D.S.I. uses DustTamer in conjunction with dry fog dust suppression systems to reduce the ambient airflow across dump hoppers and to contain the dust- fog mixture inside the hopper. Typically the screen is mounted to a frame and surrounds the hopper on three or four sides. Unlike conventional water spray or chemical spray systems, dry fog is not designed to wet the process material; it only wets the airborne dust. This makes it an ideal solution for dust from moisture sensitive materials such as coal, coke for fuel, copper concentrate, clinker and cement. Moisture addition to the material is typically less than 0.05% by weight and many times is undetectable. Dry fog systems do not require any chemicals to break up surface tension as its unique nozzle design creates 1–10 micron size droplets that are of like size to the airborne dust. Making the droplet the same size as the airborne dust particles overcomes surface tension as well as the slipstream effect that larger droplets from misting or water sprays create which are ineffective in removing particles from the air. D.S.I. nozzles flow rates are measured in gallons or litres per hour not minute, ranging from 3.5 GPH/13.25 litres per hour up to 13 GPH/ 60 litres per hour. It has been estimated that a DSI nozzle can cover the surface area of 1⁄2 a football field with fog with only 1 gallon/3.78 litres of water. This allows for the D.S.I. nozzles to create large volumes of fog in dump pockets or hoppers. In conclusion, these technologies can help any port facility comply with air quality regulations, increase worker safety, prevent product loss all while improving their public image. The Netherlands is a country that shouldn’t exist. A large part of it lies below sea level. This means that reclaiming land and then defending it against the sea and flooding has been a major focus of activity over the centuries. In turn, this has led to a wealth of experience in building large infrastructure projects and also to the growth of an innovative supply sector to service the country’s burgeoning portside and infrastructure industries. One such supplier is the Dutch firm of Verachtert. Over the last 60 years,Verachtert has become internationally renowned as a specialist in work tools for excavators, wheel loaders and cranes of all brands. The company engineers and sells products such as quick couplers, buckets, grabs, shears and hammers that are widely recognized for quality and productivity. Verachtert’s customer base includes international clients in earthmoving, road and water engineering, demolition, scrap metal processing, recycling, general industry and bulk handling. In fact, many of their products are custom-built to meet the client’s specific needs. All work tools come with an extensive services package that includes expert advice on the best tool for the job through to maintenance and repair. And the company is also a major European supplier of pre-owned tools. In 2003,Verachtert became part of the Pon group, one of Holland’s largest family businesses, which specializes in mobility- related industries worldwide. In January 2013, the company also acquired the Dutch firm DCC Grabs, allowing it to offer customers an even broader product portfolio and opening the way to servicing heavy industries such as mining and quarrying. DCC-Vantec-Grabs is fully acquainted with the market. The company constantly follows changes and trends, implementing these in the form of practical custom-made solutions. The main objective is to ensure that its grabs add value for the client, through innovative design and product development. In fact, the company’s philosophy is built on solving specific customer-related problems. DCC-Vantec-Grabs has implemented an innovative grab design that conforms to the latest environmental (pollution control) rules and regulations. Due to their strength, low empty weight and excellent quality, DCC-Vantec’s grabs have been particularly successful in the dry bulk cargo and dredging industries. The grabs guarantee a high return on investment, and save valuable time. Each DCC-Vantec grab is thoroughly inspected and tested prior to delivery. For major Dutch terminals at the ports of Amsterdam and Rotterdam,Verachtert designed and produced several special coal buckets (CAT980, CAT988 and CAT990). Activities concern the unloading and loading of dry bulk cargo from/onto sea-going vessels, coasters, lighters, trains and trucks, as well as bulk storage. The challenge with these orders was to design the most efficient type of bucket, providing both maximum storage capacity and resistance to wear. Verachtert more than satisfied these requirements. The CAT980 packs a volume of 11m3, the 988 16.5m3, and the CAT990 buckets hold 22.5m3. Currently, Verachtert is developing a 30m3 bucket for the CAT992. Naturally, these buckets are also available for brands other than CAT. The capacity of the machines was enhanced through integrated suspension, large jaw action and smart engineering, resulting in a significant reduction of the operational cost per ton of bulk cargo handled. The bucket is constructed largely from Hardox and fitted with chockey bars for extended operation. This is a perfect example of the type of customized solutions Verachtert offers for practically every conceivable situation. Verachtert is also an official dealer for trusted brands such as Caterpillar and Engcon. With the addition of the Vantec range, the company has complemented its portfolio with a line of tough work tool products based on extensive knowledge acquired over many years’ experience in the trade and reflecting a complete understanding of work conditions, materials, productivity and efficiency. And, as usual, all products can be customized to meet the client’s specific needs. The RHC company was founded in 2005, with headquarters in Germany and offices in Shanghai and Incheon/Korea. The company’s strategy is to combine European expertise and experience with low-cost production in Asia. All of RHC Heavy Machinery Ltd.’s business is based on trust, and its customers are confident in its products and services. It prides itself on being able to provide the highest international levels of quality, safety standards, reliability and performance. RHC Heavy Machinery Ltd. specializes in all kinds of heavy duty material handling. Its products include single machines as well as complete integrated systems. RHC customers come from the metallurgy industry, ports, shipyards and the mining sector. Depending on the products and applications, the engineering for the equipment will be carried out in Europe, China or Korea. Workshops are mainly in China and Korea. Equipment and systems related to the self-unloading and loading of bulk material, conveyors and terminal equipment are designed and manufactured in China, at two factories near to Shanghai with their own heavy duty shipping facilities. Both manufacturing partners are experienced in the supply of such equipment to international customers with a high demand for reliability, quality and low maintenance, as well as low operational cost. RHC’s equipment is environmentally friendly, and very efficient in operation. For the handling of coal, RHC and its partners offer several systems. These are mainly bridge- type ship-unloaders, used at small and medium sized ports, power stations, steel mills, etc. The unloader family meets all customer needs, in terms of different site conditions. Coal capacities range of up to 3,000tph (tonnes per hour). The rope arrangement uses advanced technology, and reduces the length of the ropes and the number of rope pulleys. All key components are from top-ranking international brands. For hoppers, RHC offers different designs and arrangements; for example, they can be lined and with bolted wear plates. Dust collection systems are also available. All designs are to international standards, and manufacturing partners are certified to the appropriate ISO standard, and have strict quality and process control procedures. They also have their own heavy-duty shipping pier for deep water vessels. RHC’s products are maintenance friendly, with high productivity, and are very reliable. Operating costs are very low, and the company offers after-sales service support world-wide. Stacker/reclaimers are available in indoor and outdoor design. Indoor circular stockyards are covered, so operations are not affected by heavy weather conditions, dust is much less, occupied areas are smaller. Diameters are up to 120 metres, and capacities are 2,000tph or larger for coal. Continuous shiploading systems are custom-made. They are available in different designs, with liftable main boom, and telescopic and rotating booms. These shiploaders are mainly used for ocean shipment and for larger quantity of material like coal, iron ore, grain, etc. Rated capacities can exceed 6,000tph. Within the last few years, transshipment systems for the handling of coal have become ever more popular. Quite often, coal mines are well inside countries, and coal is transported by smaller river vessels or barges to the export harbor to be loaded on ocean going vessel. Often, these locations do not have the facilities to load to larger vessels. When this is the case, transshipment systems are used, either with some buffer storage on the transshipment vessel, or for direct loading. Rated capacities of such transshipment systems are up to 2,500tph and more. RHC and its partners are well known for high performance and reliable solutions for all kinds of integrated material handling systems. Telestack Limited has recently commissioned a TS 2058 radial telescopic stacker in Chile for AES Genera, a coal-fired power station in the Port of Ventanas, Chile. The stacker is part of a complete vessel unloading and import material handling system upgrade carried out to replace the existing ageing infrastructure. and is currently expanding to nearly 3mt of annual coal consumption. The project management of AES Genera Central Thermal coal is associated with a future expansion project in the Port of Ventanas. Currently the maximum capacity is 1,300tph (tonnes per hour) discharge rate. This is made with two Kranbau cranes with level luffing, free digging, double booms each with capacity of 750tph. These cranes feed on two conventional hoppers with 100-tonne capacity which then feed on a conveyor system rated at 1,300tph. Once onto the conveyor system the material is transported to the coal stockyard via a series of static overhead conveyors and transfer towers. Once the material enters the stockyard it is transferred to the Telestack TS 2058 radial stockpiling conveyor. The new projected upgrade includes two new cranes of 1,200tph free digging with the same level luffing double boom. It is proposed the hoppers will have 150-tonne capacities and an upgraded conveyor system of 2,000 nominal tonnes per hour. The TS 2058 radial telescopic conveyor has a capacity of 2,000tph (with density of 0.85t/m3 – 2,500m3) of coal to cater for this future expansion. The machine incorporates a 1,400mm- wide conveyor belt with a 35-metre outer conveyor and 23-metre ‘stinger’ extending inner conveyor to maximize stockpile capacity. The telescopic conveyor enables an additional 30% of material to be stockpiled within the same footprint. Total stacking capacity of the TS 2058 on a 180° radius is 136, 360m3 or 109, 090 tonnes of coal (Density of 0.8 tonnes). AES Genera was able to further increase this capacity by placing the TS 2058 unit on an elevated two-metre concrete radial plinth. With the integrated windrow stockpiling programme, the machine is able to automatically stockpile coal with minimum drop height, thus ensuring product integrity is maintained and dust emissions are minimized. Telestack also supplied the equipment to be compliant with local Chilean structural standards for earthquake conditions. This involved an internal and external audit of structural integrity in order to comply with the rigorous structural standards of the Chilean Code NCh2369. These structural standards are some of the most stringent standards in the world in order to comply with local seismic conditions in event of an earthquake. As the machine is operating in a coal fired power plant the equipment also had to be compliant with ATEX standards due to the combustible nature of the material being conveyed. Telestack supplied the equipment with ATEX 21 explosion-proof motors, solenoid valves, glands, joints and junction boxes. The control panel was removed from the zone to an operator’s cabin therefore eliminating the requirement for the panel to be ATEX compliant and consequently significantly reducing the capital expenditure for the client. The equipment also incorporated dual-access walkways in order to allow the operators to carry out routine maintenance of the machine due to the machine being positioned above ground level. Impact protection at transfer points along with TIVAR 88 liners ensured efficient and effective material flow of coal over the stacker. Telestack also included ATEX compliant lighting along the machine for 24-hour operation during unloading and stacking process. Telestack delivered the equipment to site in Chile in 7×40ft- high cube containers, thus minimizing freight costs for the client. The modular nature of the equipment with quick and easy to assemble sections enables the machine to be assembled in a short period. Telestack installation engineers supervised the installation and commissioning of the equipment. The unique structural and electrical requirements of this application illustrate Telestack’s continuous commitment to supplying equipment which fulfils local standards and regulations whilst providing value for money, quality engineered and manufactured equipment on a global scale.As an ISO 9001:2008 certified manufacturer,Telestack is able to consistently meet and exceed the expectations of its customers around the world.